Since we are 34+ weeks along with this pregnancy and Justin was headed out of town for the Final Four and to celebrate his 30th birthday, my mom decided to come up for the weekend and keep Kaden and I company. I was very thankful for the extra help which she brought and the Taco Town Cheese dip too!! As soon as mom made it into town, we headed to Texas Roadhouse where we were meeting up with Tugce, Gisele and Anne for dinner. Texas Roadhouse was the perfect place to take two talkative children that have a difficult time controlling their volume, at least Kaden does... Plus they have the best rolls which keeps the kiddos satisfied until dinner arrives. I saw Tugce and Anne pull up with Gisele and ran out to greet them since we were already seated and when I came around the corner with Gisele, Kaden just squealed in excitement. He didn't stop smiling and flirting with Gisele for the longest time. The food was great, the company was even better and before we headed home, we stopped to get a few pictures of the kiddos together. Saturday was Daddy's 30th birthday and we knew he would be having lots of fun in Houston with JG and Jay so we decided to have some fun of our own and head to the zoo. 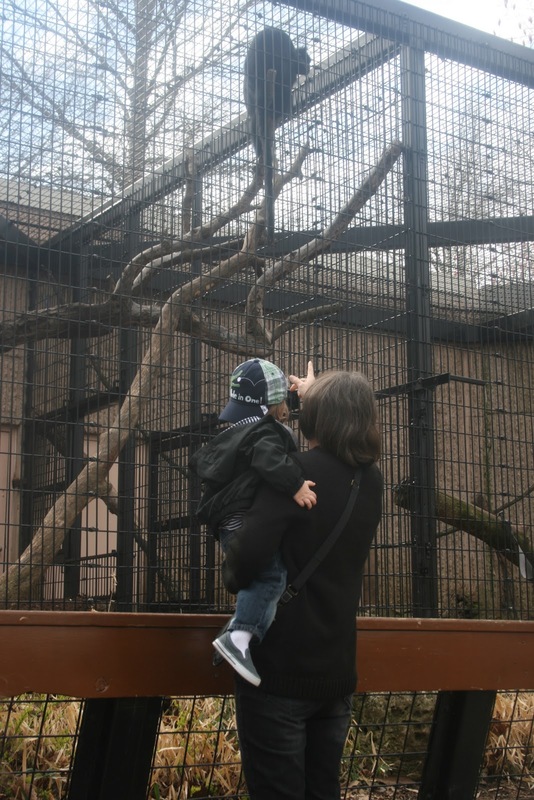 We had planned to meet Becky and Colton there at 10 and we were keeping our fingers crossed the boys would be more interested in the animals this time around than their last trip to the zoo. We got there a little early, bought out tickets and headed in to wait for Becky and Colton. As we walked in they were getting ready to feed and "speak" with the otters, Kaden jumped out of the stroller and ran to the glass, he was so excited and we were off to a good start. Soon after Colton came through the gates and joined in on the fun. 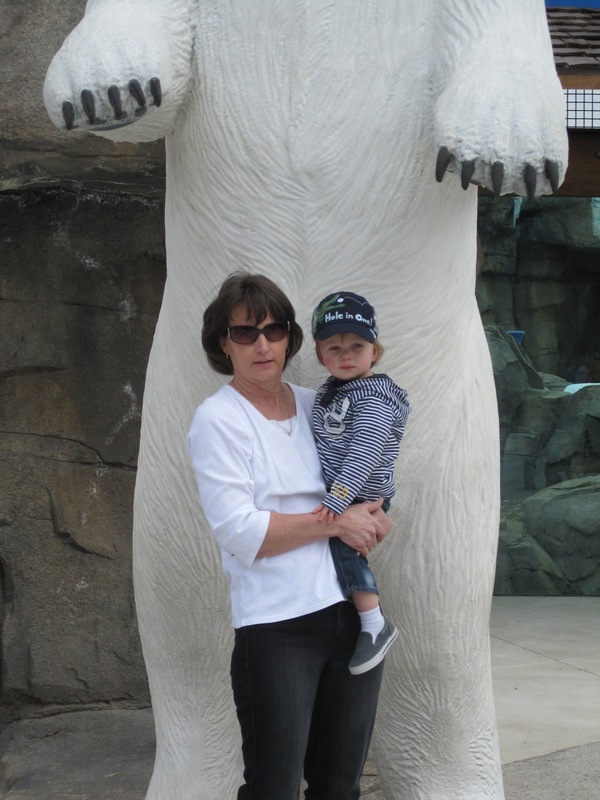 Next up, the Polar Bear and boy was he in a very good mood and willing to show all his tricks. The kids ran up to the glass and it seemed as though the bear came right up to say hello and then he did a back dive into the water and Kaden and Colton's eyes got SOO BIG. Luckily the bear was able to do this over and over and the boys just followed him along the glass. We visited Australia and saw the kangaroos, we saw lions and tigers but no bears. We visited Africa and saw the hippos and a few gators but no giraffes, chimps or rhinos because of the construction, oh well, next time maybe. As we were leaving we decided to let the boys ride the carousel-we wanted to end on a high note. Unfortunately, they both loved the carousel so much, they were very sad when the ride ended and we had to get off and they both let us know just how unhappy they were. Enter Grandma and the gift shop to save the day, Grandma Sara took Kaden into the gift shop to find a special toy for him. We walked around showed him a few things and he immediately clenched onto the stuffed monkey. He hugged and hugged this monkey until we paid for it and after we paid for it, he threw it to the ground-go figure! We spent 3 hours, walked what seemed to be 4+ miles and please don't forget all while being 9 months pregnant and we were all tuckered out. 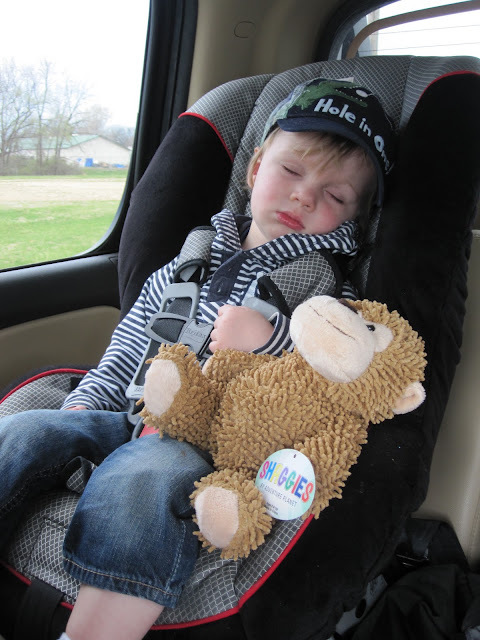 Kaden climbed into his car seat and in a matter of seconds, he was out and by the looks of it, the zoo was a success! We can't wait to go back and luckily, I bought a FOTZ pass for myself and we will be able to go back as often as we would like and a double bonus, we got free passes for our friends too!! Should be a fun summer at the zoo for all!